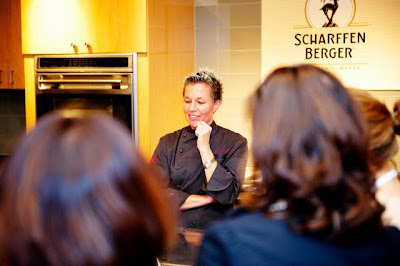 I was invited to attend a very special cooking class at the Institute of Culinary Education (ICE) a couple of weeks ago to help kick-off the 3rd Annual Chocolate Adventure Contest, sponsored by Scharffen Berger Chocolate Maker and TuttiFoodie. 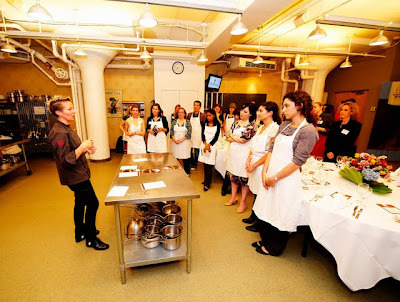 Not only was I given the chance to spend an evening cooking with and dining on dishes that incorporated chocolate as one of the ingredients, but I was also given the chance to take a class led by Chef Elizabeth Falkner from Top Chef Masters and Iron Chef America. When I accepted the invitation to attend the event, I knew I was in for a fun evening, but I didn't realize how many food bloggers I knew from Twitter would also be in attendance. Finally! A chance to put a Twitter username with an actual human face! Over appetizers and drinks, including the Thai Confusion (pictured above), I chatted with Marc from No Recipes, whom I've seen at a handful of food events recently; Adriana from Sustainable Joy; Olga from Sassy Radish; Jennie from In Jennie's Kitchen; Ulla from Goldilocks Finds Manhattan; and Anna from Very Small Anna. Eventually, we were led into the kitchen area, handed aprons, and instructed to wash our hands so the class could begin. 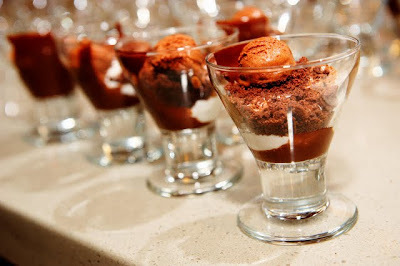 Once we were introduced to the Adventure Ingredients for the 2009 Chocolate Adventure Contest, Chef Falkner began to talk us through the recipes for two of the components for her Night Flights dessert - the Chocolate Mousse and the Smoked Salt Cacao Nib Streusel. We would be helping make the desserts we'd be eating later on in the evening, so the pressure was on! I finished up the egg whites just as Marc, Ulla, and Lisa finished melting the chocolate and dealing with the egg yolks, raw honey, and cream. Teamwork at it's finest, folks. Don't you just want to stick your finger into that chocolate mousse and have a little taste? Trust me. It was very hard for all of us not to! After the stations had been cleared down and pushed out of the way, Chef Falkner answered questions from members of the class and from people who had joined the festivities over the Internet. We were asked to clear the kitchen so the staff could set up for the dinner, so Anna and I posed for a quick picture before grabbing our table assignments and some more wine and sitting down to our meal. 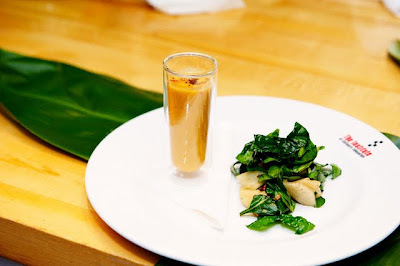 Our first course consisted of a Spiced Pumpkin-Coconut Soup with Cocoa-Wattleseed Creme, Crispy Bacon and Fresh Pomegranate, which was accompanied by a Spinach and Walnut Salad with Pears and Cacao Nib Vinaigrette. I had never eaten anything with wattleseed in it before, so the soup intrigued me. Wow! What an experience that soup was! From the smooth creaminess of the pumpkin and the coconut, to the slight spiciness and nuttiness from the wattleseed, to the the salty crispness of the bacon, to the tartness from the pomegranate - this soup had it all. It wasn't difficult to understand why it was the 2008 First Place Winner in the Savory Category. 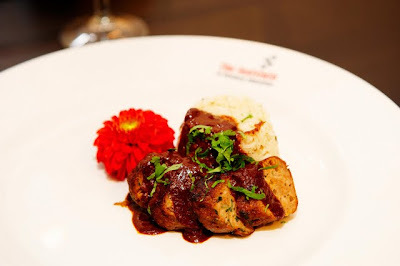 Our main course was Scharffen Berger Mole-Infused Chicken Mango Sausages with Lemongrass Scented Scharffen Berger Cacao Nib Rice Pilaf. Such a unique dish! The flavor of the chicken sausage was fantastic. Though, I found the lemongrass a little too overpowering for my tastes and thought the rice pilaf was a bit dry. Then again, the dish as a whole was a sign of ingenuity well beyond my current capabilities in the kitchen, so who am I to criticize? Right? And, here is the finished dessert, ready to be devoured! Honestly, I was astounded by how amazingly well all of the components worked together. As much as I wanted to work my way slowly through all of the layers so I could enjoy them on an individual basis, this dessert was just begging to be eaten from the bottom up. The flavors of each layer were accentuated when I dug the spoon all the way to the bottom of the glass and scooped up a little bit of everything - the Chili Chocolate Sauce, the Pandan Coconut Milk Pudding, the Chocolate Mousse, the Smoked Salt Cacao Nib Streusel, and the Chocolate-Mint-Ginger Sorbet. So, so delicious! I left ICE that night with a full stomach and with lifted spirits after meeting and getting to know my Twitter friends a little bit better. I even I pulled out the card listing the 2009 Adventure Ingredients for the Chocolate Adventure Contest and started formulating some early ideas for entries while riding the subway back home. I just hope I can come up with a dish (or two?) that can compete with the likes of the previous winners and finalists. Good thing I have until January 3, 2010 to submit my entries! 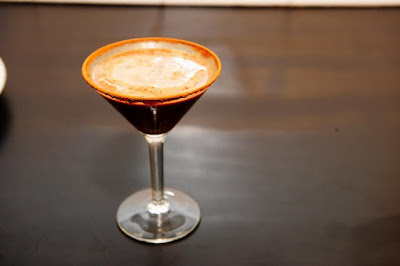 I'm going to need some time to plan... And some taste-testers to help me as I work through some recipes.